We are living in a world and in a society dominated by a negative relation between the behaviors and values of the human being that has originated numerous social problems and conflicts: violence of all kinds - even among school children- environmental degradation; marginalization; poverty; consumerism; drug addiction; and more. If we take a realistic look at the causes of this outlook, we easily come to the model of socialization and predominant relationships in our society: we live in a culture of violence and contempt, which must be changed. Faced with this reality we demand that actions be taken as soon as possible. We ask for preventive actions to curb unwanted behaviors. We demand that the public authorities and the different agents of socialization (family, school, peers, media ...) reach agreements and implement proposals that bring about radical changes in our social model. There is no question that today's society must change. 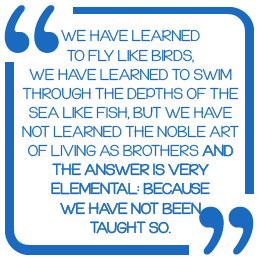 And this change can only come about through the creation of an EDUCATIONAL SOCIETY. A society where the agents involved in achieving peaceful coexistence act in a coordinated manner and along the same lines: with political leaders making wise decisions that do not result in confrontation, not only between nations but within the nation itself, or the political leaders themselves, which in most cases can only be described as shameful (there is no more pathetic show than to see political leaders disqualifying each other instead of jointly seeking solutions to the problems of the society that they should be leading), offering instead an image of effort and work; with the media offering programs and news of social significance and not rubbish; schools offering programs based on values ​​and respect and not on the mere attainment of knowledge. In the meantime, those of us who think that the world can be a better place will continue to struggle for it. And those of us are the teachers, from early childhood education to high school. Joyce A. Myers is credited with the phrase "Teachers can change lives just with the appropriate blend of chalk and challenges." Or going even further, education is the task that can transform society more deeply because the future of the whole world depends on it. The professionals of the education of young children should be the first ones to try with all our strength to fill the minds of the children we educate with norms, values, concepts and behaviors towards the achievement of peace and the rejection of violence as essential components of their personalities. And we must do this at the time when the child is forming his personality, not later, as stated by scientific research. 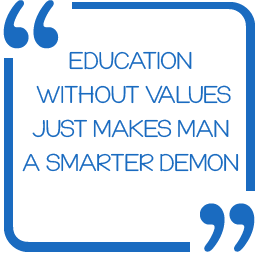 This is why we have to make educational systems consider Education for Peace - VALUES EDUCATION - as a priority, and that this should begin when education begins, which is at no other time than the very moment of birth. If educational systems do not do it (due to government regulations), we, the teachers, have to do it ourselves, we should contribute our grain of sand to make this change possible. Do you want to be a committed Educator for Peace, committed to a better world? The answer is very simple: the more we are, the stronger we will be, the louder our voice will ring and the sooner society will become aware that it is us, the teachers who want, and are struggling, to build a better world from our classrooms. You only need to fill out the registration form available at this link to join the Network of Educators for Peace. When we receive your registration form, we will send you a certificate (in pdf format). In addition to recognizing the work of teachers to achieve a better world, the World Association of Early Childhood Educators (WAECE – AMEI) is offering educators a free program of classroom activities in Values Education for Early Childhood and Primary School. 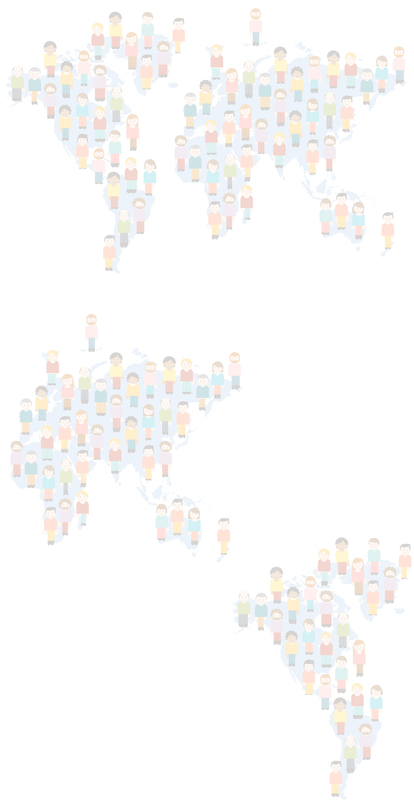 You will receive our monthly newsletter with listings of exchanges of educational exchanges between teachers, special resources and relevant news. 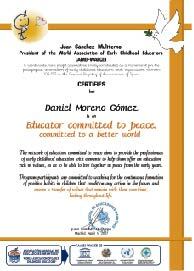 In addition to the certificate you will receive an image that you can include in your e-mail signature to proclaim that you are an Educator Committed with Peace to help spread the word about our work.